only began to realise the extraordinary nature of the Games themselves when they were nearly over. The meeting was never adequately advertised by the Exhibition authorities, who must have thought they needed no advertisement, and the prices of the seats were at first placed so high that whole blocks remained empty. 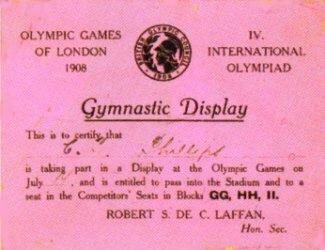 This was a matter, of course, in which the British Olympic Council could not unduly press their views, for they took the Stadium as a gift from the Exhibition authorities, and were naturally obliged to allow those authorities a fairly free hand in the methods they chose to recoup themselves for their expenditure. But it soon became obvious that prices which ranged from £8. 8s. for a box on the opening day to 2s. 6d. for an upper row any morning other than the first or last were much too high, even for the western side along the swimming-bath ; and though prices were originally given at 6d. for standing room on the east side, the other seats on that side were at first also fixed at much too high a figure. The lack of advertisement seriously affected advance bookings, and the rain of the first week discouraged even Londoners from coming in large numbers. Nor could appeals in the newspapers after the Games began convince the public that only a fortnight was given them for seeing the greatest athletic gathering in the history of the world. Yet on Marathon Day at least 9o,ooo persons were in the Stadium looking on, and those outside were offering from 10s. to £5 for a seat. A total of at least 300,000 persons must have seen the Games in all, which means more in England than, for instance, it might do in Athens, where the whole available population within reach of the sports came to see them every day. The English audience, on the whole, changed from day to day, with a few notable exceptions, and we may therefore consider that in spite of every difficulty a creditable proportion of our population saw the Games of 1908, in so far as those carried out in the Stadium are concerned. And I am not taking into account now either the spectators who witnessed all the Olympic events in other places during the year, or the enormous crowd that watched the Marathon Race all the way from Windsor to the very gates of the Stadium.